"It's really difficult for me as a survivor to accept that." 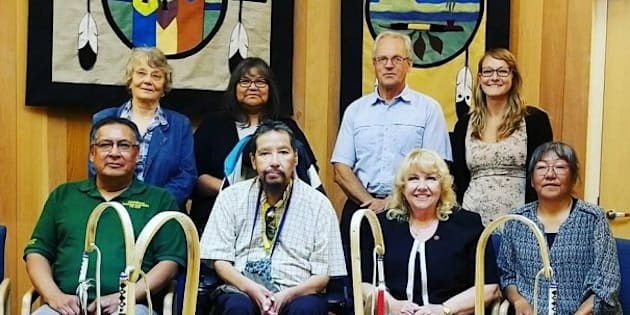 The Sioux Lookout mayor's committee on truth and reconciliation met with Sen. Lynn Beyak in July. The mayor didn't want this photo to give the impression that all is well between the two parties. Members of a truth and reconciliation committee that welcomed controversial Sen. Lynn Beyak this summer want people to know that a cordial photo-op doesn't mean the meeting went well. "We engaged in dialogue with Senator Beyak because she comes from northwestern Ontario where there were nine residential schools. It is important for all Canadians to know and understand this history," Sioux Lookout Mayor Doug Lawrance said in a news release on Monday. The town of Sioux Lookout in northwestern Ontario provides services to 29 remote First Nation communities and their 30,000 residents. Beyak lives nearby in Dryden. Lawrance's committee on truth and reconciliation invited Beyak to a meeting this July after she told the Senate in March that "some good things" came from Canada's "well-intentioned" residential school system. Beyak has been back in the news with an open letter on her website, stating that the current system isn't working and that Indigenous people should trade their status for Canadian citizenship and a payout. Garnet Angeconeb attended the July meeting with Beyak. He is a member of the Lac Seul First Nation and attended the Pelican Lake Indian Residential School from 1963 to 1969. "I was disappointed," Angeconeb told HuffPost Canada about Beyak's letter. "Some of her statements were not based on fact. For example, [telling Indigenous people to trade] treaty or status cards to become Canadian. I took a little bit of exception to that because I'm already a Canadian," he said. Garnet Angeconeb is a residential school survivor who met with Sen. Lynn Beyak in July. He said he is disappointed and discouraged by her recent comments about Indigenous people. "I did not expect to change her views on anything when we met with her last summer, but I did expect her to be a bit more understanding and empathetic to the issues," Angeconeb added. "To continue on, to direct those comments at [residential school] survivors, it's really difficult for me as a survivor to accept that ... It's like if I went out and made comments about veterans in one of the world wars." Sioux Lookout's mayor also wants to set the record straight after news articles suggested that Beyak spent her summer meeting with Indigenous groups. "In fact, the Senator met with T & R Committee for approximately three hours," Lawrance said. And a photo showing Beyak with members of the committee may be misleading. "The photograph carries the impression that all is well between our committee and the senator. Clearly that is not the case," said the mayor. "I hope it is not the senator's intention to use this photograph to send a misguided message. Obviously the senator needs to brush up on her knowledge and understanding of Indigenous issues." HuffPost Canada has reached out to Beyak's office for comment. About 150,000 First Nations, Inuit and Metis children were taken from their families and forced to attend government schools. A federal Truth and Reconciliation Commission heard graphic testimony from survivors who detailed physical, sexual and emotional abuse. An estimated 6,000 children died at the schools.